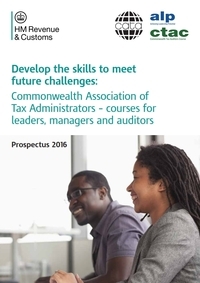 Arrangements have now been finalised for the 2016 Achieving Leadership Potential Course and the Commonwealth Tax Auditors Course. Both of these highly regarded international training programmes are provided by HMRC on behalf of CATA and involve a period of residence in the UK. Applications are now invited for places on both ALP and CTAC. Cick on the link below to examine the full prospectus and download an application form. Please note that the closing date for applications is Friday 26 February 2016.